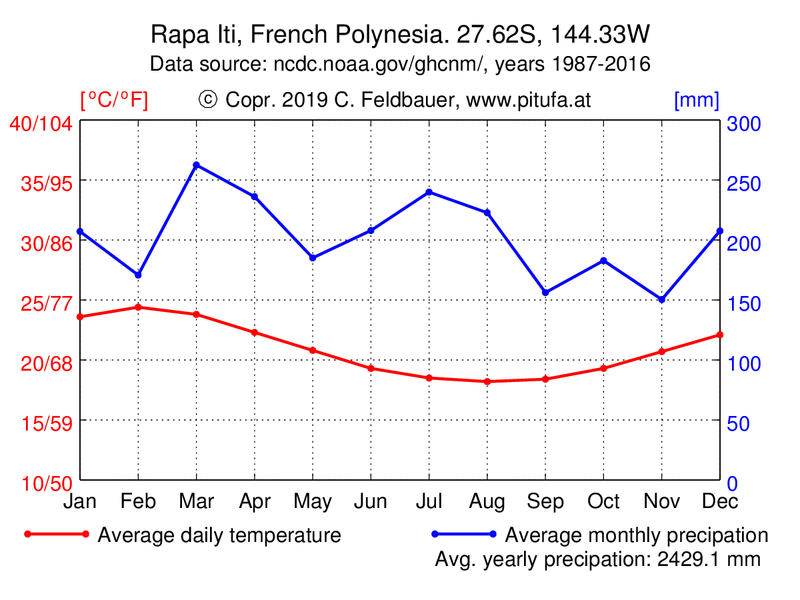 Rapa Iti is the remotest island of French Polynesia. There is no airport, the cargo ship only comes once a month (sometimes it skips a visit…) and Raivavae, the nearest neighbouring island, lies 290 nm away. The anchorage inside the huge main bay of Rapa is well protected from waves, but gusts howl down from the mountains whenever there are winds from North, West, or South–and that seems to be most of the time Easterly winds enter the bay more steadily, but the massive coral reef across the entrance protects from swell and larger chop. The only two villages of the island lie on the N and S sides of the huge bay. Area on the northern shore is just a cluster of houses (a bit more than 100 people live here) and the main village Haurei (about 400 people) lies opposite on the S side of the bay. That’s where the primary school, the medical center, post office and town hall are located. We went to check in with the (only) policeman who opened his office on a Saturday for us. He told us that 2017 only 11 sailboats stopped in Rapa Iti, so visitors get an extra-warm welcome here, which makes up for the cool climate: in winter the temperature goes down to 10 degrees and even in summer long sleeves and socks are a good idea whenever a cold front brings howling winds and heavy rain to the island. When the island was discovered by Europeans in the 18th century more than 2000 people lived on the island, but with the European ships diseases and alcohol were introduced and the population dwindled to only 120 by the middle of the 19th century. Today the population is about 500 people, but many islanders have moved to Tahiti or other bigger islands to work there. The people are proud of their history and have managed to keep a special status within the French administration. Rapa is autonomous in many areas and next to the ‘maire’ (mayor) the ‘council of 7′ (Tohitu) makes decisions where land or culture are concerned. At the height of the ancient Polynesian civilisation the island was deforested, later on pines and other trees and shrubs were introduced and endemic ferns have regrown as well, so nowadays the overall impression around the main bay is lush and green again, even though many of the steeper slopes have remained barren. The main bay of Rapa Iti is infamous for tricky anchoring. Cruising guides mention ‘dead coral rubble’ at the bottom, the bay is very deep (20-30 m) and uneven. Many boats have dragged and fouled their anchors and chains here. When we first visited Rapa Iti in December 2017 we found that large areas of the bay are indeed covered in live staghorn coral–especially the shallower parts (less than 15 m) that are inviting for anchoring as recovering fouled gear is easier in less depth. As we always try our best not do damage any coral we were horrified to have our chain grinding down the delicate structures. We thought that a mooring would be the best solution for that problematic situation and presented this idea to the mayor, who immediately agreed and got us in touch with Alexandre, the foreman of the community workers here. After some brainstorming and researching they started constructing a 2.4 ton cement block with a well-made rebar structure and strong attachments. During the holidays work stalled, then they had to order more parts from Tahiti, so the mooring wasn’t finished when we left. Returning in December 2018, we found the project still ongoing, but by then all parts had finally arrived and two blocks were ready to go. The main problem now was how to deploy the heavy blocks as the island doesn’t have a working platform or barge. We built a raft made of 8 gasoline drums (welded together with a frame) and after many attempts and near-disasters we had the block at the marked spot and sank the raft together with the whole mooring arrangement. Once it was down we cut the raft free that broached like a metal whale, and afterwards we freed the chain, buoys and line–ta-dah, the first mooring is finished!! Use 2 of your lines to attach to the mooring (one on port, the other on starbord of the bow). Don’t pull the buoys up on deck, as this causes damage to the mooring rope. The buoys are made of soft foam, so they don’t bang against the hull. More moorings will hopefully follow–check our blog for updates! Another option is to go alongside the main dock, which is usually free as the supply ship comes only once a month. Depending on the wind direction yachts tie up either on the front side, or on the short western side. There are 2 minimarkets in Haurei that have very basic supplies. There’s no veg market, but fruit is usually available from private gardens when you ask the friendly locals nicely. Rapa Iti has a service station at the main dock where gasoline and diesel is available (2 hours daily, you have to pay for the fuel at the mairie first). The locals invite visitors to join in their communal activities (making popoi from taro roots, baking bread in the big communal ovens, church festivities, etc.). Rapa Iti was colonised by Polynesian settlers about 1000 years ago (sources vary on that). The limited resources of the small island (Rapa is only 40 km2 big, but most of that land area is rugged and mountainous) led to conflicts among the growing population and the construction of 15 fortresses on the hilltops. The remnants of the fortresses are still visible along the rim of the main caldera and well maintained paths lead to 3 of them, most popular are Morongo Uta and Tevaitahu ((the mountain road starts near the football field in Haurei, where the road ends a path to the left leads to Tevaitahu and to the right to Morongo Uta). Only some stone walls remain, but the impressive views over the main bay and the opposite coastline are worth the effort of climbing up. Another easy hike leads from Area eastwards along the coast and then up the ridge. From there you can either follow the ridge to the entrance of the bay or up the mountain to the remnants of a fort. We spent Christmas 2017 and January 2018 in Rapa Iti and fell in love with this remote gem and its lovely people. Apart from its rough weather, Rapa is a perfect cruising destination and a hikers' paradise.